You may have noticed, especially if you also follow me on Facebook and/or Twitter, that I seemed to be going extra hard for the Ravens during their recent run to a Super Bowl championship. But why? As I recently laid out my sports allegiances, you'll notice that the Ravens are my #2 NFL team, but you'll also notice I've had relatively little opportunity to root for my own team on the grandest stage. One of the most poignant was Allen Iverson dragging the 2000-2001 76ers on his back to the NBA Finals against the Lakers. 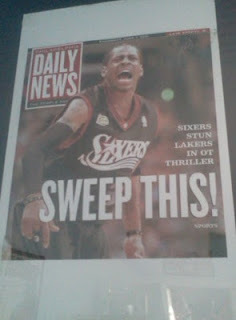 The Philadelphia Daily News cover commemorating AI and crew thwarting what all expected to be a sweep still hangs on my wall - never mind that, save for the opening game, they did indeed sweep that. In 2002, the Terps made it to the mountaintop, with men's basketball winning the NCAA championship. Still, at that point I had far more interest in sitting back in Catonsville and taking bets on property damage in College Park after having witnessed the riots the year before after the Final Four loss to Duke. I did get to see "my" team break an 86 year streak in 2004. After a monstrous ALCS comeback over the hated New York Yankees, the Boston Red Sox went on to win the World Series. Still, baseball falls pretty low on my depth chart of major sports, and besides, at that point I was in school with folks who actually lived and died by the Sox. This championship was for them, not for me. My real shot came in early 2005, as my own Philadelphia Eagles finally got over the NFC Championship hump and headed to the Super Bowl to face the New England Patriots. Sadly, the Birds fell short in that one, failing to quench a then-22 year championship drought for the city of Philadelphia. Then, it seemed nearly a tease in 2008 when the Philadelphia Phillies won the World Series. I was nothing but happy for the city of Philadelphia and for the entire Delaware Valley that roots for its teams, but the Phillies are the one Philly team that isn't my primary in its respective sport, so once again, this one wasn't for me. So as this postseason wore on and the Baltimore Ravens inched ever closer to the Super Bowl, I found myself once again once again rooting less for a team and more for a city. This past Tuesday, I proudly watched a city I love celebrate with a championship parade, just as I did back in 2008. But once again, it wasn't my championship. Maybe next year.